It's a little bit lazy to do this but I thought as my colours for June and July are so similar it made sense to group them together rather than boring you with what would be pretty much the same post twice. We've had some lovely days so far this month and I've managed to get a few things going on in the garden. This is where I love to see colour, rather than inside, and getting a few pots full of summer bedding plants really makes things come alive. Unsurprisingly, I am always drawn to fuchsias and bright pink geraniums, with a few splashes of white and purple thrown in between. Those of you who follow me on Instagram will already have seen the new additions to the balcony area - I just can't resist a pink/orange combination! Magenta. Not only my favourite colour (Process Magenta to be precise) but I think it's my favourite word too. It's a pink that's all grown-up; it's confident, impudent and has sass by the shedload. It says 'look at me!' and then sticks two fingers up when you do. It is what is called an 'extra-spectral' colour, which means that it is not found on the visible spectrum and is integral to both the RGB (TV and computing) and CMYK (printing) colour systems. I think this makes it rather special. I've been drawn to this particular shade of pink ever since I can remember - I even got my mum to knit me a mohair jumper (so 80s!) in this colour when I was about 8 (although I never actually wore it as it was too itchy lol!). It's a colour that I just can't resist - even though I had intended to keep my place all Scandi and neutral it just keeps on creeping in everywhere, from my phone cover to the feathers on the cat scratcher I made. And my sofa seems to be breeding magenta pink cushions, just like this one below! Pink is, after all, the 'navy blue of India' (according to fashion editor, Diana Vreeland) so it kind of goes with the territory. It looks great when teamed with teal or grey but, as I mentioned above, my favourite pairing is with orange. June is the time when this colour really comes it to its own, inside and out. As we head towards the sultry summer heat of July the colour that I associate most with this month is still pink but it is deeper and less saturated than magenta with more purple undertones. 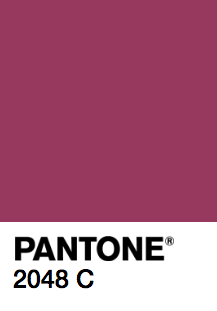 It has taken hours of searching online to find the exact colour that I see in my mind's eye and the closest I have come is Pantone 2048 C. Somewhere between raspberry and plum, this colour evokes images of alfresco dining, with pavlovas and berry compote. The closest paint colour I have found is (speaking of pavlova!) Dulux's Russian Velvet 3. This is a great choice if you want to take your interiors from summer in to winter, teaming it with creamy whites and blush tones first and then, for a more dramatic look, swap these for rich jewel tones like sapphire and emerald. The vibrant, watercolour florals by BluebellGray are a good way to introduce this colour among a broader palette but if you're feeling especially brave (not to mention flush) why not decorate your walls with this fabulous pattern from Timorous Beasties' Rorschach collection? At £300 per roll, it's certainly not for the faint-hearted but what a statement! Team with white gloss and chrome for a contemporary look or, if you like a little eccentricity, you could go down the Victorian Gothic route and mix it with dark wood, black and brass accessories. 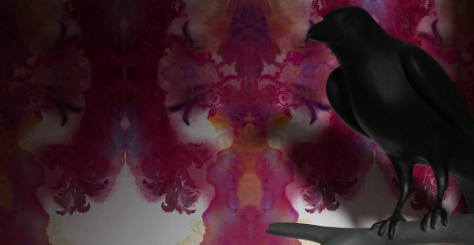 Oh, and don't forget the taxidermy raven.